R.M. Winslow and K.W. Chapman, Pilot-Scale Preparation of Hemoglobin Solutions. B.J.-M. Thevenin and S.B. Shohet, Detection of Red Cell Membrane Components in Human Hemoglobin Preparations. B. Masala and L. Manca, Detection of Globin Chains by Reversed-Phase High-Performance Liquid Chromatography. P. Ferranti, A. Malorni, and P. Pucci, Structural Characterization of Hemoglobin Variants Using Capillary Electrophoresis and Fast Atom Bombardment Mass Spectrometry. M.P. Cohen and V.-Y. Wu, Purification of Glycated Hemoglobin. 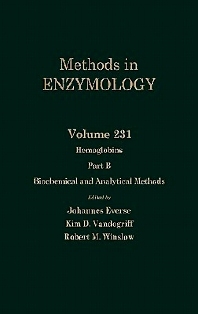 R.I. Roth and J. Levin, Measurement of Endotoxin Levels in Hemoglobin Preparations. H.H. Ruf, A.G. Altemaller, and K. Gersonde, Preparation and Characterization of Insect Hemoglobins from Chironomus thummi thummi. S.N. Vinogradov and P.K. Sharma, Preparation and Characterization of Invertebrate Globin Complexes. A. DeYoung, L.D. Kwiatkowski, and R.W. Noble, Fish Hemoglobins. C. Fronticelli and E. Bucci, Conformational and Functional Characteristics of Bovine Hemoglobin. E. Tsuchida and T. Komatsu, Synthetic Hemes. R.P. Roy and A.S. Acharya, Semisynthesis of Hemoglobin. A. Tsuneshige and T. Yonetani, Preparation of Mixed Metal Hybrids. J.M. Manning, Preparation of Hemoglobin Derivatives Selectively or Randomly Modified at Amino Groups. M.J. Rao and A.S. Acharya, Amidation of Basic Carboxyl Groups of Hemoglobin. R.E. Benesch, Bis(pyridoxal) Polyphosphates as Specific Intramolecular Cross-Linking Agents for Hemoglobin. R.Y. Walder, M.E. Andracki, and J.A. Walder, Preparation of Intramolecularly Cross-Linked Hemoglobins. D.L. Currell, Derivatives of Hemoglobin Prepared by Reaction with Aryl or Alkyl Isothiocyanates. S.L. MacDonald and D.S. Pepper, Hemoglobin Polymerization. H. Xue and J. T.-F. Wong, Preparation of Conjugated Hemoglobins. R.T. Jones, Structural Characterization of Modified Hemoglobins. T.-H. Jessen, N.H. Komiyama, J. Tame, J. Pagnier, D. Shih, B. Luisi, G. Fermi, and K. Nagai, Production of Human Hemoglobin in Escherichia coli Using Cleavable Fusion Protein Expression Vector. D. Looker, A.J. Mathews, J.O. Neway, and G.L. Stetler, Expression of Recombinant Human Hemoglobin in Escherichia coli. J.E. Ogden, R. Harris, and M.T. Wilson, Production of Recombinant Human Hemoglobin A in Saccharomyces cerevisiae. J.J.M. de Llano, O. Schneewind, G.L. Stetler, and J.M. Manning, Purification and Characterization of Recombinant Human Sickle Cell Hemoglobin Expressed in Yeast. M.P. Reilly, S.L. McCune, T.M. Ryan, T.M. Townes, M. Katsumata, and T. Asakura, Preparation of Recombinant Hemoglobin in Transgenic Mice. J.S. Logan and M.J. Martin, Transgenic Swine as Recombinant Production System for Human Hemoglobin. J.M. Rifkind, O. Abugo, A. Levy, and J. Heim, Detection, Formation, and Relevance of Hemichromes and Hemochromes. V.W. Macdonald, Measuring Relative Rates of Hemoglobin Oxidation and Denaturation. C. Giulivi and K.J.A. Davies, Hydrogen Peroxide-Mediated Ferrylhemoglobin Generation in Vitro and in Red Blood Cells. R.E. Benesch, The Stability of the Heme-Globin Linkage: Measurement of Heme Exchange. S.S. Panter, Release of Iron from Hemoglobin. K.W. Olsen, Thermal Denaturation Procedures for Hemoglobin. J. Everse, Photochemical Reduction of Methemoglobin and Methemoglobin Derivatives. E.L. McGown, M. Khan, and K.Dill, Regeneration of Functional Hemoglobin from Partially Oxidized Hemoglobin in the Presence of Molecular Hydrogen and a Multicomponent Redox Catalyst. J. Everse, M.C. Johnson, and M.A. Marini, Peroxidative Activities of Hemoglobin and Hemoglobin Derivatives. L. Zilletti, M. Ciuffi, S. Franchi-Micheli, F. Fusi, G. Gentilini, G. Moneti, M. Valoti, and G.P. Sgaragli, Cyclooxygenase Activity of Hemoglobin. J.J. Mieyal and D.W. Starke, Hydroxylation and Dealkylation Reactions Catalyzed by Hemoglobin. G. Belvedere and M. Samaja, Oxidation of Olefins Catalyzed by Hemoglobin. S.R. Tannenbaum and P.L. Skipper, Quantitative Analysisof Hemoglobin-Xenobiotic Adducts. J.S. Wishnok, Quantitative Mass Spectrometry of Hemoglobin Adducts. P.L. Skipper and W.G. Stillwell, Aromatic Amine-Hemoglobin Adducts. M. Tirnqvist, Epoxide Adducts to N-Terminal Valine of Hemoglobin. S.S. Hecht, S.G. Carmella, and S.E. Murphy, Tobacco-Specific Nitrosamine-Hemoglobin Adducts. K. Taghizadeh and P.L. Skipper, Benzo[a]pyrene Diol Epoxide and Related Polynuclear Aromatic Hydrocarbon Adducts of Hemoglobin. B.W. Day and K. Singh, Analysis of Hemoglobin Adducts by Fluorescence Spectroscopy. E. Tsuchida and T. Komatsu, Addendum to Article . Author Index. Subject Index. Biochemists, molecular biologists, cell biologists, physiolgists, pathologists, biophysicists, clinical chemists, industrial and academic researchers involved in the preparation of hemoglobin derivatives and in the preparationand analysis of recombinant proteins. University of California, Department of Medicine and Veterans Affairs Medical Center, San Diego, U.S.A. Professor Winslow received his M.D. degree and postgraduate training in internal medicine and hematology at the Johns Hopkins University and Hospital. He studied hemoglobin biochemistry at the Massachusetts Institute of Technology and Molecular Biology at the National Institutes of Health. His research, for more than 30 years, has been aimed at the intersection of the synthesis, structure and function of hemoglobin, in such areas as sickle cell anemia, high altitude physiology and hemoglobin-based oxygen carriers. Professor Winslow previously headed the Blood Research Division at the Letterman Army Institute of Research, responsible for the US Army's blood substitute program. Between 1991 and 1998, he was a Professor of Medicine, leading a blood substitute program at the University of California at San Diego (UCSD), supported by the National Institutes of Health. Professor Winslow has also served as a consultant to many private companies and has been an advisor for, among others, the Federal Aviation Administration (FAA), Food and Drug Administration (FDA), the Institute of Medicine of the National Academy of Science, the Pan American Health Organization, the National Institutes of Health, the Department of Defense and a number of foreign governments. He has written more than 200 scientific articles on clinical, physiological and biochemical aspects of hemoglobin and oxygen transport.